The quick, easy way to leap into the fascinating world ofphysical computingThis is no ordinary circuit board. Arduino allows anyone,whether you're an artist, designer, programmer or hobbyist, tolearn about and play with electronics. Through this book you learnhow to build a variety of circuits that can sense or control thingsin the real world. Maybe you'll prototype your own product orcreate a piece of interactive artwork? 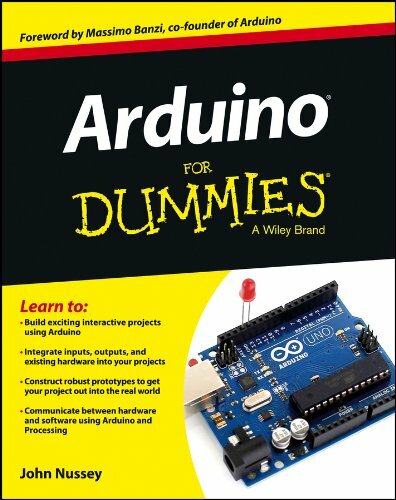 This book equips you witheverything you'll need to build your own Arduino project, but whatyou make is up to you! If you're ready to bring your ideas into thereal world or are curious about the possibilities, this book is foryou. ? Learn by doing ? start building circuits and programmingyour Arduino with a few easy to follow examples - rightaway!? Easy does it ? work through Arduino sketches line by linein plain English, to learn of how a they work and how to write yourown? Solder on! ? Only ever used a breadboard in the kitchen?Don't know your soldering iron from a curling iron? No problem,you'll be prototyping in no time? Kitted out ? discover new and interesting hardware to makeyour Arduino into anything from a mobile phone to a geigercounter!? Become an Arduino savant ? learn all about functions,arrays, libraries, shields and other tools of the trade to takeyour Arduino project to the next level.? Get social ? teach your Arduino to communicate withsoftware running on a computer to link the physical world with thevirtual worldIt's hardware, it's software, it's fun! Start building the nextcool gizmo with Arduino and Arduino For Dummies.